Published by George Baxter in 1850, this print was used as an illustration in the Scripture Pocket Book for 1851. “This abbey is about two miles from Llangollen. It stands in the centre of a small verdant meadow at the foot of a high hill called Bron Vawr. The situation is one of the most beautiful and secluded in the kingdom, and the remains of the abbey are the finest ecclesiastical ruins in Wales." This Cistercian abbey was founded about 1200 by Madoc ap Gryffydd Maclor, Lord of Dinas Bran, and was dedicated to the Virgin Mary. Its name of Crucis, according to some, came from the adjacent cross known as Elisego Pillar; but others claimed it was because the abbey had a piece of the true cross in its possession which was given to Edward I in return for several immunities. 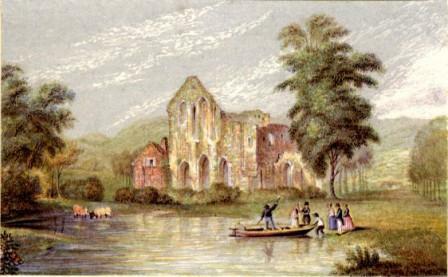 The abbey had been converted into a farmhouse before the print was published although it retained many of its monastic features. Three rows of ground arches, or single-row pillars, support the dormitory, which had been converted into a hay loft. The derelict church is overgrown with tall ash trees, which partly conceal the ivy-clad walls. Baxter Process Print, size 3 7/8 x 2 3/8 inches. This print is unsigned.